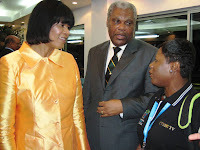 Janice Whittle from the NCF passed on this nugget to me, the fact that Patrick Manning seems to have a secret blog, first it was on WordPress like Underground, Margin & BFP but now there is a new location for it as the CARICOM blogger was drawing real heat, eh-eh! The entries seemed harmless enough, en’t? Doo-doo, you really thought you could keep this blog secret from me? Who controls the mouse in this family? I?m surprised you could even turn on the computer by yourself. By the way, I saw you and ?Chrissy? perfectly clearly from the TV room window using those special infra-red goggles that came with the last blimp. And you know what else came with the blimp? A tiny little microphone that could pin into your lapel, so small you wouldn?t know it was there. And it broadcasts straight into the headset in my command centre?er, I mean, walk-in closet. So you better watch yourself with that Madame Minister. It?s a good thing this blog is secure and the general populace of sweet T&T can?t read it. Imagine if they found out the father of the nation, the man who supposed to lead them down the road to Vision 2020 (or whatever the latest crap catch-phrase is), didn?t know till last night what a blog is? Now if you?ll excuse me I have a gmail chat date?er, appointment?with JJ?um, the Hon. Attorney General. Just off the phone with Portia. Called mainly to wish her success in the upcoming election and congratulate her on the unprecedented peacefulness of this year?s campaign season, but also for us to pray together. It?s a long time since we?ve done that. I asked her if she thought it was okay if I prayed for something bad to happen to Andr? Monteil. ?Like ?ow bad?? she asked. I said maybe not death, but perhaps a severe illness, or an accident. She said she she thought that was fine – those were no worse than some of the things she?s prayed would happen to Bruce Golding. Portia said God has told her personally that he makes special exceptions for things that are clearly in the national interest. “The Secret Blog Of Patrick Manning” is very hilarious, so go the new site and look for the RSS feed and subscribe ASAP! It is grand to read that post. Thanks for that. I like Caribbean politics and anywhere else for that matter. I definitely want to read more soon. Wow, pretty interesting view on Caribbean politics. Is it open to RSS subscription?